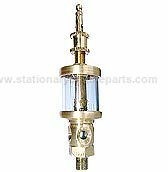 Solid Brass bodied sight feed lubricators, also known as drip feed oilers. Supplied with a 1/4" BSP male thread fitting and a quality Acrylic clear window section of approximately 1, 9/16" diameter. 50 ML oil capacity. Sight feed lubricators are ideal for continuous operations. Liquid is dispensed when the oiler is turned on with a toggle on the top of the oiler, fine adjustment is possible from the adjustable top nut and needle valve assembly.